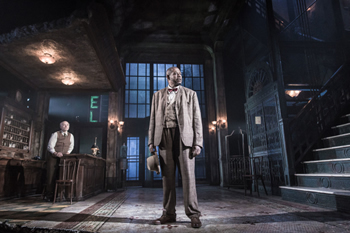 There are two stars in this version of Hughie, O’Neill’s rarely revived, late one-act, directed by Michael Grandage: Forest Whitaker and the majestically seedy set by Christopher Oram. Whitaker is so gentle and guileless as the logorrheic lead character Erie Smith he makes me feel I’ve never seen the role before. So much more human and relatable than the bluff and thick-headed character Jason Robards immortalized on a film of the same name, Whitaker is the first Erie I’ve ever sympathized with rather than pitied. O’Neill’s play is essentially a monologue by a two-bit gambler who has badly lost his way after the death of his pal Hughie, the night clerk at the dingy Broadway hotel where Erie lives. One gathers that Hughie propped up Erie’s ego by listening to his endless stories, and as the play opens Erie arrives at the hotel after an extended post-funeral drunk to find the desk staffed by a new clerk, played by an aptly taciturn Frank Wood. Retrieving his key, Erie is reluctant to go up to his lonely room. He avoids the steep stairs like a gallows (the elevator is broken) and he fills the 3 a.m. silence by gabbing. And gabbing. Gabbing for his very life. The sole plot question is whether the silence, magnified by sporadic sirens and subway rumbles, will swallow this floundering washout before he talks himself upright again. Shrewdly, Whitaker never tries seriously to enlarge Erie. His intense vulnerability is worn on his sleeve from the outset. We care what happens to him primarily because of his emotional availability, which makes Wood’s emotional stinginess seem villainous by comparison. Interestingly, Whitaker’s race deepens this effect, as the action is set in 1928 and a powerless African-American (Erie is no Jack Johnson) who blusters like Erie about wheeling and dealing and bedding numberless “blondes” would be either seriously deluded or seriously courting trouble. The historical fracture of this new layer of vulnerability sheds rich light on the play. Then there is Oram’s towering lobby set. A monumental cascade of cold metallic steps, worn wood and discolored marble bathed by the sickly green glow of a neon HOTEL sign outside the windows, it makes splendid use of the Booth Theater’s high proscenium, crowding and bullying the actors like some hulking architectural cop constantly pressuring them to move along. Somehow, despite its hostility, this space also feels graceful because it so reeks of failure, deception, broken hopes, and lethal life-lies. Sitting lethargically motionless for long spells under his harsh desk lamp, Wood seems more manikin than man, a catatonic mockery of the confidante Erie so desperately needs. The set is ultimately a stand-in for the imaginary adversary he must conquer to regain his confidence. Hughie will not be done again this well for a very long time. It’s an hour long, and a damn fine way to spend an hour at that.